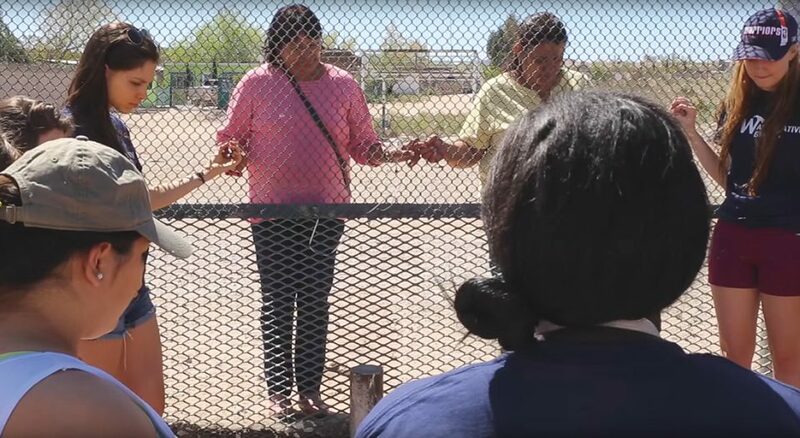 Participants of the border immersion program of Cristo Rey, an ELCA welcoming congregation in El Paso, Texas, pray at the fence between that city and Juárez, Mexico, with congregants who were deported. The plight of migrant children in the U.S. has captivated the nation the last several months. But tens of thousands of children—and their families—have sought refuge in the U.S. for the last decade. Many are from El Salvador, Honduras and Guatemala, countries where the ELCA has long-standing relationships with companion churches. The network provides congregations the opportunity to do just that by accompanying migrant children and their families, most of whom are fleeing their homes due to violence, said AMMPARO program director Mary Campbell. What does a welcoming congregation do? Before AMMPARO existed, many congregations worked with migrants on their own. When the 2016 ELCA Churchwide Assembly adopted AMMPARO by a vote of 922-11, it became clear this was an issue the church wanted to tackle together. Today, there are 112 welcoming congregations and sanctuary congregations (those that provide shelter to migrants) with more joining every week, Campbell said. Spiritually supporting migrants by welcoming and ministering to them. Physically supporting migrants through the U.S. immgration system by connecting them with community resources. Advocating for migrants through positive public policy change. Welcoming congregations aren’t required to provide housing, legal fees or other tactical work, though they may. The congregation, which partners with Our Saviour Lutheran, Boston, is located a few blocks from the Salvadoran Consulate. For two years, Nuevo Amanecer has functioned as a community center for Latin Americans, who make up more than 50 percent of the population in the surrounding area, and has supported the large Colombian and Mexican population. Community members have varying degrees of immigration status, Carlson said. “We decided to become a welcoming congregation because when we read the description of what [it] is, we were already doing some of that work,” she added. That includes attending immigration hearings with migrants, writing character reference letters, and providing spiritual and emotional support. It did not include becoming a sanctuary congregation; Carlson said it’s not a fit for their community. For Sanchez-Guzman, being a welcoming congregation does involve providing shelter to migrants—at times. Cristo Rey is less than 2 miles from Annunciation House, which provides hospitality to migrants being released from detention centers. In December 2016 the nonprofit asked area churches to provide overflow shelter for the ever-increasing number of migrants, and Sanchez-Guzman and a small group of volunteers agreed to assist. The next month, they officially became a welcoming congregation. Twice a month, Cristo Rey opens its doors on a Tuesday to receive migrants, feed them, provide overnight shelter and call their families so they can buy a bus or plane ticket to get to their court date on time. By Friday, most are gone. Becoming a welcoming congregation isn’t an “all-or -nothing” endeavor. It takes just a small number of congregants to extend their hand to those in need. Churches also don’t need to be near the border to participate. Kendra Stea, a member of Lake Park Lutheran in Milwaukee, leads the congregation’s partnership with Llano El Coyol Lutheran in El Salvador. “[As a welcoming congregation], we’re raising our hand to say, if somebody in our sister community comes to the bishop and says, ‘I am leaving the country,’ they can give them a list of churches. If you show up on our door, you are welcome here. We will support you spiritually, and we will help you find resources,” she said. While no immigrants have knocked on its door yet, three young women from Lake Park’s partner congregation have reached out to Stea to ask if she knows of a Lutheran church in their new U.S. location. “It’s easy to connect them to someone for housing, for other things,” Stea said. “But for a place where they feel safe and a place where they can find God and strength and hope, that’s a tougher issue.” That’s where membership in the Welcoming Congregation Network becomes an asset, she added. As they’ve learned more about the immigration process, Lake Park has also worked to educate its community, including teaching vacation Bible school children what it means to be an immigrant. Those numbers peaked in 2014, when 70,000 unaccompanied minors and another 70,000 people, mostly mothers and children, from Central America’s Northern Triangle crossed or were apprehended at the U.S. Southwest border. In fiscal year 2018 (Oct. 1, 2017, through Sept. 30, 2018), 50,031 unaccompanied minors and 107,212 people in families, mostly mothers and children, crossed from those same three countries, plus Mexico.